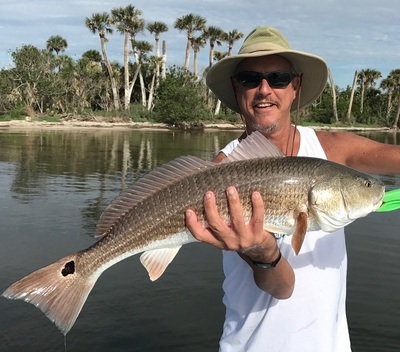 Summer 2017 has been off to a great start for Indian River and Mosquito Lagoon backcountry fishing here at New Smyrna Beach Florida, water quality remains good, large numbers of bait fish schools through out the area, with mullet, pilchard, and menhaden. Morning weather has been great with pretty skies, light winds, and backwaters full of life, early morning surface striking game fish like Seatrout, Jack Crevalle, and Ladyfish eating minnows as well as jumping shrimp, on the edges and deeper holes we have also been catching Redfish, Black Drum, a few Snook, as well as summer Whiting, Croakers, Spots, and lots of Mangrove Snapper, most eating our live shrimp baits. 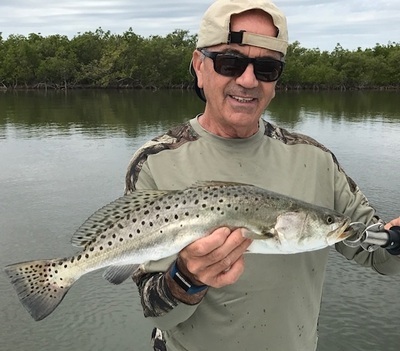 Hunting Redfish on the grass flats of the Lagoon is a fun summer challenge to find and cast to shallow water Reds, regular client Robert from Daytona out with me recently got to see tailing Redfish, casting to a small school hooking up with this 28" fish also catching a couple other Reds and several Seatrout������..
Don from Texas brought his son, nephew, and sister again on another mixed bag trip while on their annual Florida vacation, another fun trip with several Black Drum, Seatrout, Snapper, Jacks, Ladyfish and a few Snook including this nice 2 foot linesider caught by Don�����..
New clients Pat and Chuck from Palm Coast Florida had a great time in the backcountry catching all the variety fish topped by Pat's big Redfish which just had to have our free lined shrimp������..
�..Josh landed a quality Seatrout while sight fishing the flats����..